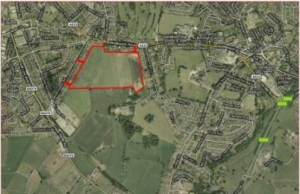 Cllr Michael Jones, leader of Cheshire East Council, is seeking legal advice over Eric Pickles’ decision to allow Fox Strategic Land & Property permission to build 280 houses after a lengthy court battle. Jones said the Secretary of State’s decision this month to overturn an inspector’s recommendation at Abbey Fields was a “blow to Sandbach” and the development was “unsustainable”. A finalised Local Plan is expected to be sent for approval to the Government in summer. A spokesman for the council said: “Cheshire East is one of many local authorities without a Local Plan in place following unsupported Local Government Reorganisation prior to 2009 [the dissolution of Cheshire County Council, six district councils and creation of Cheshire East and Cheshire West & Chester. The council is currently consulting on the development strategy for the borough, which is a robust, jobs-led strategy to deliver targeted and sustainable development in Cheshire East.” The council said its plan will deliver 27,000 new houses and 20,000 new jobs.